June 22nd 1941; Hitler said of this day "the world will hold it's breath". This book is entirely about one day during World War II. This was probably the most decisive day of the war. Hitler's decision to attack the Soviet Union sealed his and the 1000 year Reich's fate, although at times during Barbarossa it seemed like the Germans were close to victory. The book starts with Hitler making his decision to attack the Soviet Union. It continues with the planning behind Barbarossa. The author shows that there was a fundamental difference in the thinking of Hitler and his General Staff. The General Staff's plan was always based on taking Moscow and then finishing the other operations. Hitler, however, had no interest in taking Moscow. He wanted to take Leningrad and the resources of Southern Russia. His thinking was to link up with Finland, but mostly he needed the oil and ores of Southern Russia. The author has filled the book with everything he could: facts, figures, and maps galore. From the build up of the German Army on the Russian (right under the Soviets' noses) frontier to the unleashing of Barbarossa, the book brings you all of the background and information you would want. It also has a good number of photos showing the action, troops, and military hardware during that fateful first day. The story of all three German Army Groups are shown (North, Center, and South). It also shows the day from the Soviet side as well. From the outside, it seemed that the Germans had the day all their way. However, there were signs that showed how brutal and difficult this invasion was going to be for the Germans. The book covers all of the ground from the highest strategy of the attack to the tactics used by the combatants. The book is interspersed with first person accounts of the fighting as well. The book is separated into the planning, and then has chapters on the actual fighting taking place within all three German Army Groups' territory. It then goes into the Air War. The next chapter goes into the different thoughts and actions taken by both High Commands after the first day. The author shows, through their letters etc., that the simple German soldiers already knew on this first day that their war was now different. The savagery and brutality of the Eastern front was apparent to all even during the first twenty-four hours. The book comes with numerous appendices and copious notes. It shows the war in the air, and on the ground. 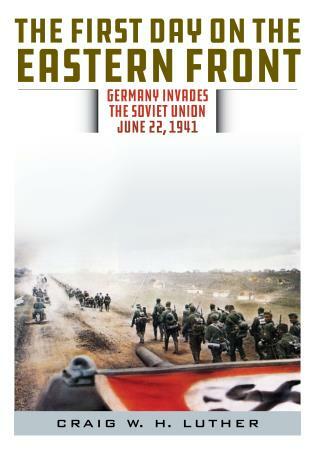 I can recommend it to anyone who is interested in the military history of the Eastern Front. Thank you Rowman & Littlefield Publishing Group for the chance to review this excellent and well written book. Looks very interesting. Thanks for sharing. I'm going to check it out.